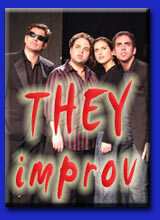 THEY improv provides a variety of entertainment options for law firms looking to entertain their personnel, recruit new associates or for client appreciation. These shows include improv comedy shows, game shows and improv comedy along with a few other mixtures to enhance the prestige of the firm. For the attorneys, an opportunity to celebrate victories or simply blow off steam can improve performance and reduce stress to enhance future success! While the focus of this website is about our training programs as well as our role-playing for the purpose of enhancing lawyer techniques, our company has earned a solid reputation or entertaining at corporate events around the country. We provide improv comedy, game shows and murder mysteries for a wide range of companies and can bring our skills to reduce stress and entertain your law firm. Reduce Stress. One of the main problems facing law firms is the stress. Associates and Partners alike put in long hours and need to blow off steam every now and then. Our entertainment options are great choices for letting loose and having a good time. Team Building. Several of our programs are great at getting employees to bond with one another and to work together as teams. Just let us know what you are trying to achieve and we can help you get there. Recruitment. We have worked with firms over the years and come up with programs to get Associates feeling more as part of the team, as well as to get prospective Associates to enjoy a night out and get to know the people they might be working with. Client Appreciation. A great way to retain clients is to show them, from time to time, that you appreciate they're business. THEY improv has performed at many such events and we have ways to get your people directly interacting with your clients and make them look and feel like rock stars. Interaction is the Key. We have many things that we do to entertain groups. But one of the most important elements is the we interact with our audiences and get them engaged. This can include bringing people up on stage, having direct interactions at the tables or even serve to entertain around the room during more of a meet and greet. Learn More. You can learn more by visiting our entertainment website. ,br> Locations. We have people already in most major cities around the country or can make arrangements if needed. This includes the top cities such as New York, Philadelphia, Pittsburgh, Chicago, Los Angeles, Miami, Orlando, Houston, Austin, Dallas, Seattle, Phoenix, Denver, Minneapolis, Milwaukee, Nashville, Atlanta, Charlotte and practically anywhere else you can imagine. We also have access to Canada, Mexico and the islands of the Caribbean if you would like to conduct something while at a retreat. Simply contact us to find out how we can help you.